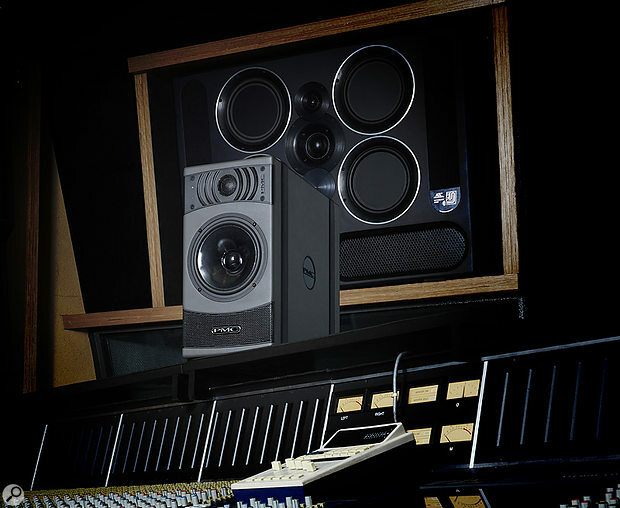 When the Professional Monitor Company (PMC) started in 1990 they had just one product: the enormous BB5 studio monitor, a flagship studio loudspeaker which has only recently been superseded. The elegantly compact LB1 and mid-sized AB1 two-way passive monitor speakers quickly followed, though, and both featured the chamfered-top cabinets characteristic of PMC’s ‘Advanced Transmission Line’ (ATL) construction back then. PMC’s model-naming convention in those early days was equally unique, as it was based on cabinet size and design iteration — so the BB5 was the fifth version of a ‘big-box’ speaker, while the ‘little-box’ and ‘average-box’ models were first-generation designs. A couple of years later this bijou range was supplemented with the passive two-way TB1 (‘tiny-box’) nearfield monitor, the ancestor of the product reviewed here. The TB1 proved extremely popular and, by 2001, it had metamorphosed into the second-generation TB2. 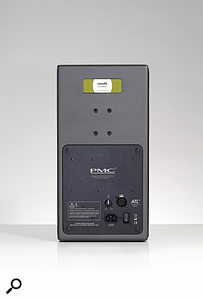 Over the following decade it gained an integrated power amplifier module to become the ‘activated’ TB2S-A — initially with a Flying Mole amp, and later PMC’s own more powerful DS-001. Good though the TB2 was (and over the last 25 years I’ve owned a variety of TB1s and TB2s, and still have a pair of TB2S-A II speakers in a surround-sound setup), its core design is a bit long in the tooth now, and in a market dominated by true active monitors (ie. designs with a separate amp for each driver) it is looking a little outdated. Moreover, PMC’s understanding and implementation of the unique ATL cabinet design has also evolved considerably since the TB model was conceived, as has their bespoke loudspeaker driver technology. Consequently, it seemed to me that an updated and upgraded replacement for the TB2 was overdue, but whereas the company’s impressive TwoTwo range (reviewed in July 2013, March 2014 and December 2015) fits the bill in terms of physical size and format, its use of sophisticated DSP technology inevitably prices it above the reach of the typical TB2 customer. So to address that specific sector of the market, PMC have come up with a brand-new and rather more affordable two-way model of roughly the same size as the TB2. It is designed and built entirely in the UK, it conforms completely to PMC’s high standards of build and sound quality, and it incorporates all of the company’s advances in ATL cabinet design and driver technology. The cost savings compared to the equivalently sized TwoTwo model come largely from its very straightforward all-analogue configuration. In essence, then, this is the company’s new entry-level professional monitor, and it’s called the Result6. The number refers to the notional size of the bass-mid driver (and holds the door wide open for future smaller and larger siblings). On unpacking the Result6 loudspeakers, I had a brief moment of déjà vu: the ATL vent grille at the bottom of the front baffle bears a striking similarity to the long-discontinued Digidesign RM2 monitors, which were designed by PMC for Avid in 2007. I raised this observation with the boffins at PMC and was assured that there really isn’t anything in common between the Result6 and RM2 apart from the bezel that holds that perforated vent plate in place — they just happened to end up the same size. Clearly, though, the design experience gained from the RM2, as well as PMC’s subsequent TwoTwo monitor range, has informed the development of the Result6 in countless ways, but especially in the construction of the ATL. Although a very similar size and format, the most obvious physical difference between the Result6 and the previous generations of TB monitors relates to that ATL grille. In all of the TB (and DB) models, the ATL vents to the rear, which is less than ideal in many ways, not least because it restricts placement near the front wall. In developing the RM2, PMC found a way of constructing the ATL within the very compact cabinet so that it vented to the front, and the same idea was later employed in the TwoTwo range and now here, in the Result6. Consequently, the perforated grille covering the ATL vent sits just below the bass/mid driver, and its gently radiused shape is reflected in the tweeter bezel above the bass/mid driver. With the ATL venting to the front, the Result6 can be placed much closer to walls, a feature that will be a most welcome and pragmatic benefit for many potential customers working in compact project studios. PMC’s classification of their cabinet construction as an ‘Advanced Transmission Line’, as opposed to a more familiar ported or sealed-box design, has caused considerable confusion and consternation over the years. However, a common definition of a ‘transmission line’ states that this condition applies if the line is longer than a 10th of the wavelength of the signal it is conveying. The Result6’s notional lower frequency limit is 45Hz, which has a wavelength of 7.6m. A 10th of that would be 0.76m, but the ATL length in the Result6 is 1.5m. The line length is thus closer to 20 percent of the signal wavelength at that frequency, so it sits comfortably within the ‘transmission line’ zone. That said, the physics and acoustics of this kind of cabinet construction are complicated and, perhaps surprisingly, not very well researched or documented outside of PMC’s R&D facility. However, the basic concept is that the bass/mid driver energises the line from a point near (but not at) the sealed end, and carefully selected and shaped absorbent materials placed along the line soak up the mid-range energy radiating from the rear of the bass/mid driver, leaving just the lowest octave to emerge from the vent on the front baffle. At mid-range frequencies, the bass/mid driver is effectively working in a sealed-cabinet environment, while in the lowest octave, its rearward energy emerges (more or less) in the same polarity as the wavefront from the driver itself. Thus the vent acts like a second bass driver to provide significantly greater low-frequency extension than would be possible from a similarly sized conventional loudspeaker. Other useful benefits of the ATL cabinet include a near-constant internal cabinet air pressure due to the action of the acoustic treatment inside the line, providing a consistent load on the bass driver’s cone, which helps to minimise harmonic distortion. Also, the internal panels and bracings that form the line help to strengthen and damp the cabinet to make it very resistant to vibration and flexing. Subjectively, the ATL design also seems to bestow the monitor speaker with an uncanny ability to maintain its low-end extension and balance even when listening at low levels. The three pairs of arced ridges arranged on either side of the tweeter are a brand-new innovation for PMC, called ‘D‑fins’. These represent an innovative approach to tackling the problem of edge diffraction. Moulded PMC logos are let into the cabinet side panels, and a pair of ‘decoupling bands’ run all around the cabinet from top to bottom. 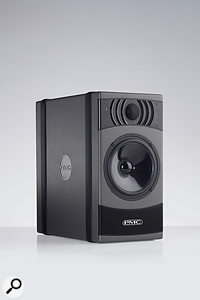 These serve the same function as the ‘D‑cups’ featured on the company’s TwoTwo monitors, providing a non-slip mounting surface as well as reducing the passage of vibration into the speaker’s supporting structure. Perhaps the more intriguing feature is the three pairs of arced ridges arranged on either side of the tweeter: these are a brand-new innovation for PMC, called ‘D‑fins’. These represent an innovative approach to tackling the problem of edge diffraction. It is well known that the sound waves from the tweeter radiate outwards until they reach the edge of the baffle, where the sudden change in acoustic impedance causes some of that sound energy to reflect back across the baffle, interfering with the direct sound from the tweeter. This causes an uneven high-frequency dispersion pattern and unwanted response peaks and dips. The conventional way of dealing with this is to radius the baffle’s edges; that simple expedient reduces the step change in acoustic impedance significantly, minimising the reflected energy, and most modern loudspeakers have rounded baffle edges for this very reason. However, PMC’s new D‑fins tackle the problem far more assertively, because they are designed to ‘catch’ the reflected sound waves from the baffle edges and redirect them outwards in a controlled way, with the net benefit of reducing the typical high-frequency tweeter ‘beaming’ effect while also smoothing the off-axis high-frequency response. As a result, this clever acoustic manipulation provides a substantially wider listening sweet spot, and a more consistent dispersion of high frequencies into the room. Turning now to the Result6’s drivers, both are newly developed specifically for this monitor speaker. The tweeter is a 27mm soft-dome unit, and features a neodymium motor system with ferro-fluid cooling. 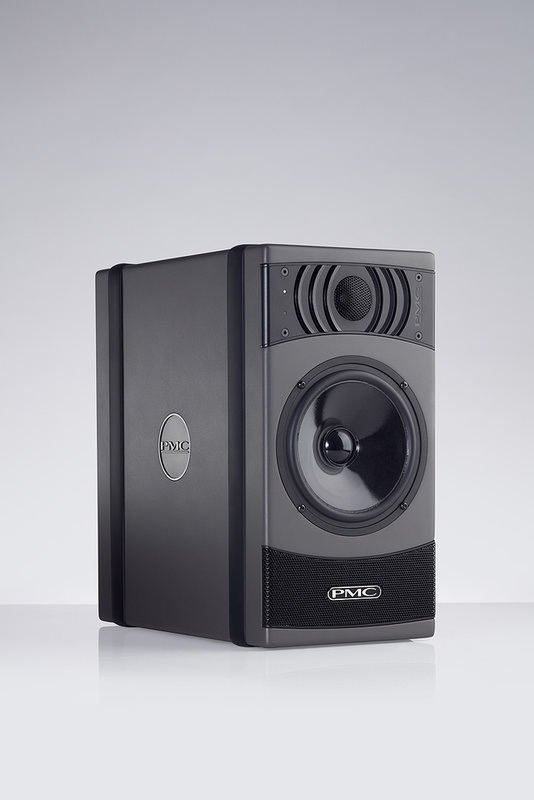 Most of PMC’s professional monitors employ a perforated ‘acoustic lens’ over the tweeter, and the Result6 is no exception. The perforated grille is not there simply for protection; it plays an important role in controlling the tweeter’s dispersion, and also helps to extend its output smoothly beyond 20kHz. The low end is handled by a new 170mm (6.5-inch) bass/mid driver with a doped natural-fibre (ie. paper) cone. Its cast-alloy chassis provides a very rigid platform, while also dispersing heat from the motor assembly. PMC started using laser-measuring techniques to assess the cone movement in bass drivers during the development of their IB2S-A model a few years ago, and the same approach has been employed in designing and fine-tuning the bass driver for the Result6 — not only in isolation, but also when installed in the cabinet’s ATL to fine-tune the line design and optimise the driver’s acoustic loading. Moving around to the rear of the Result6, the facilities couldn’t be any simpler. The manufacturer’s model identification label and serial number are affixed to the top of the rear panel, just above a quartet of threaded anchor points to accommodate a variety of optional mounting hardware, such as the TwoTwo’s tilt/swivel wall brackets. The lower portion of the rear panel is taken up with a flat metal plate which forms the amplifier chassis and serves as its heatsink. This became no more than comfortably warm during my extended auditioning. The electronics chassis is suspended on four simple rubber isolation mounts to decouple the amplifier circuitry from any cabinet vibration. The signal path starts with the requisite EMI/RFI filtering before the analogue line-level crossover filters split the audio signal at 2kHz, with fourth-order (24dB/octave) slopes to feed the tweeter and bass/mid driver. A dual-band ‘power limiter’ handles driver protection duties, triggered by ‘non-invasive’ sensors monitoring the inputs to each power amp. A second LED alongside the tweeter flashes red if either limiter is activated. It’s worth noting that as this is an all-analogue design, there is no intrinsic latency here, unlike all DSP-based monitors, which may be of relevance to some potential customers. The amplifiers employed in the Result6 are, like those used in the TwoTwos, highly efficient Class-D types, configured to provide a nominal 65W for the tweeter and 100W for the bass/mid driver, although the Result6 sounds considerably more powerful than those numbers imply. The specifications claim a maximum SPL capability of 112dB at 1m (within a decibel of the old TB2’s rating), and that is a lot in a nearfield context. The frequency response is given as 45Hz-22kHz, but no tolerance limits are included in the rather sketchy published specifications, so these figures are ‘open to interpretation’. Interestingly, the old TB2’s lower frequency limit was given as an equally vague but slightly lower 40Hz. I’m not in a position to provide accurate acoustic measurements myself, but I can say that the Result6 managed to reproduce all the tones down to 32Hz from my bass step-tone test remarkably well — and cleanly — with only a relatively modest reduction in level and power compared to the tone at 100Hz, which I think is impressive for a monitor with a 6.5-inch driver. It performed noticeably better than the TB2S-A II in that respect, which may be an indication of how much PMC have developed the ATL cabinet design. I mentioned earlier my lengthy association with PMC’s ‘tiny-box’ nearfield monitor through most of its variations but, although the TB2 is still a capable performer, the cost/performance ratio of competitors’ monitors has improved noticeably over the last 20 years, and I can’t deny that the TB2 has been showing its age in comparison. The Result6 is most definitely the TB2’s very worthy successor. It clearly builds strongly on all of the TB2’s positive characteristics including its ‘British voicing’, but in a simple, no-frills package that just works — and works beautifully.While I was impressed with the technology and performance of PMC’s TwoTwo range of nearfield monitors, their sophistication inevitably prices them beyond the budgets of the kind of customers who might previously have sought something like the TB2, so I’m extremely pleased to report that the Result6 is most definitely the TB2’s very worthy successor. It clearly builds strongly on all of the TB2’s positive characteristics including its ‘British voicing’, but in a simple, no-frills package that just works — and works beautifully. For my auditioning tests, I dropped the Result6s into the place of my trusty old TB2S-A II monitors as the front left and right elements of a 5.1 setup (the rest of the system comprising DB1s for the rear channels, an LB1 for the centre, and a TLE1 for the LFE.) After a quick level alignment using a cheap analogue handheld SPL meter and a band-limited pink-noise test signal I was up and running. My immediate impression was that little had changed: the familiar detailed but natural PMC voicing was still there, the imaging was solid, voices sounded natural, and the bass was tight and well controlled. However, as I worked through my usual commercial test tracks I started to appreciate a slightly cleaner and more extended low end, with better definition and separation of bass instruments. There is also a noticeable improvement in mid-range transparency, and I found it slightly easier to listen into the detail of a mix, which proved particularly beneficial when I started remixing some archive material; in short, I found making EQ decisions a little easier and quicker, which is a very good thing! When solo working in front of a computer screen, as most of us do, the sweet spot doesn’t need to be all that wide, compared with working at a large-format console or with racks of outboard. However, when I deliberately moved off-axis I found that the Result6 maintained a more consistent tonal balance than the TB2s at the high end, and this does indeed translate into a wider sweet spot. The practical benefit is that you can shuffle sideways to let a colleague listen to a mix beside you without completely messing up the tonal balance or stereo image, and the high-end balance is also more consistent throughout the room. In a direct comparison with my old TB2s I also formed the impression that the precision and stability of the stereo imaging was improved, too. Individual sound sources became more three-dimensional and ‘solid’. Reinstating the old TB2S-A IIs at the end of the review period reinforced the improved transparency and refinement achieved by the Result6’s: it was one of those ‘you’ll miss me when I’m gone’ moments! Clearly, the new drivers, the separate power amps, the line-level crossover, the D‑fins, and the front-venting ATL all play their individual parts in the Result6’s overall performance gains, and I am extremely impressed with what PMC have achieved here. If I was asked to define what the TB2 should deliver in 2018 the Result6 would be it! When I reviewed the final incarnation of the ‘tiny-box’ speakers — the TB2S-A II — back in July 2010, a stereo pair cost £2350 in the UK. Today, eight years later, a pair of fully active Result6s costs just £50 more, which should see the Result6 in a strong position in a great many customers’ shortlisted monitor auditions. The professional monitor market is extremely competitive, and a lot of manufacturers are incorporating DSP-rich features like built-in room correction in the hope of gaining a marketing edge. While such facilities obviously have their place, they are certainly no substitute for good acoustic engineering, and I find it refreshing that PMC have focused their efforts specifically in that realm with the Result6 — and achieved superb results. 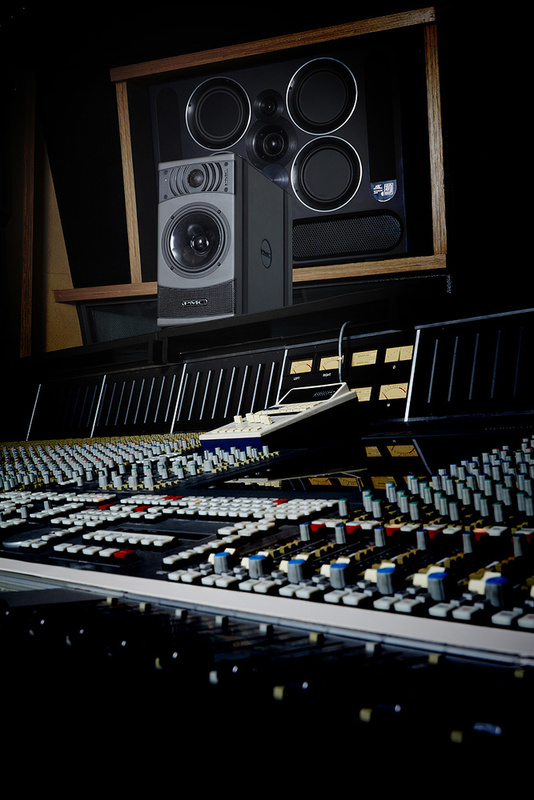 Similarly priced two-way active monitors include the Quested S8R MkIII and the DSP-laden Genelec 8340 SAM. There’s also the Amphion One12 Mobile system (comprising passive monitors and separate power-amp modules). With a slightly larger budget the options include the Geithain RL906 and the Amphion One15 powered monitors, while the Dynaudio Lyd 48 (three-way) monitors, Focal Solo6 Be, PSI Audio A14M and Unity Audio Rock MkII are all a little less expensive. Improved bass extension and accuracy. Improved HF control for a larger sweet spot and better imaging. Front ATL vent expands placement options. None to my ears — but some might miss EQ facilities. A worthy successor to the ever‑popular TB2, the new Result6 is a refined, all‑analogue, two‑way active monitor that benefits strongly from PMC’s development of the ATL cabinet as well as some innovative new technology in the form of D‑fins. While sharing the character and convenience of the TB2, the Result6 raises the quality benchmark but not the price. £2400 per pair including VAT.